There is an edible world around us that was expertly known and used for millennia before the arrival of the first Europeans to North America. 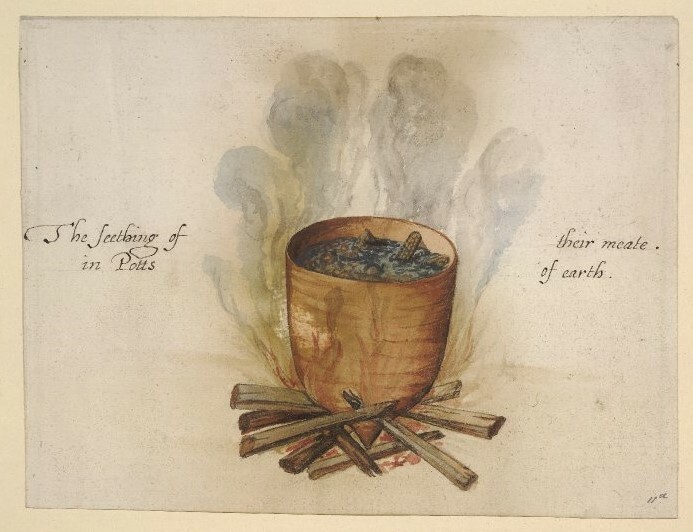 Even the early settlers had an acute knowledge of plants and their culinary and medicinal uses. Today, much of the knowledge once considered essential for life has been traded for easily accessible and neatly packaged foods and medicines. It can be easy to forget that much of what we take for granted, both in cuisine and medicine is deeply rooted in the past. Indigenous knowledge of the natural world has been passed from generation to generation through a rich oral tradition. The study of plants and their uses through cultural knowledge is called ethnobotany. Beyond the staples corn, beans, and squash, famously referred to as the three sisters, a multitude of other plants were utilized by the prehistoric people who thrived in North America. In many parts of the world, similar traditional knowledge persists to this day out of necessity or tradition. 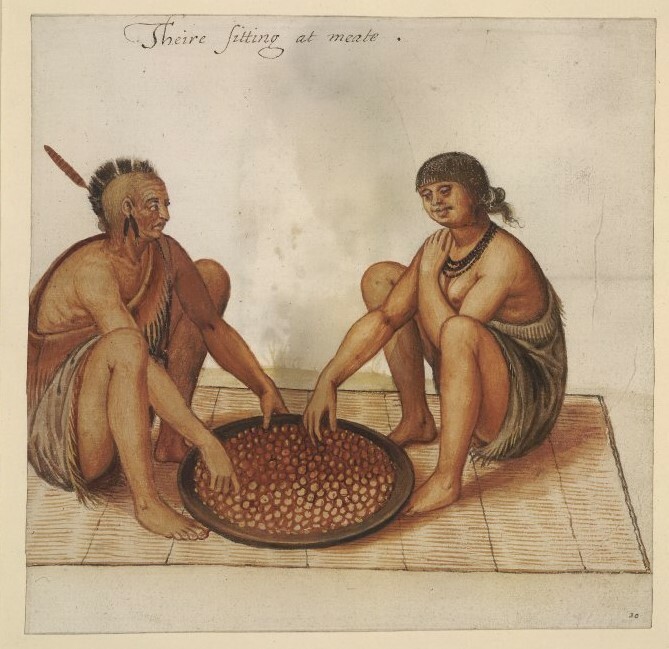 A indigenous man and woman sitting on a rush mat eating fruit(?). Plant remains are relatively rare in Pennsylvania’s archaeological record due to the poor preservation of organic material, but plant use is well documented in ethnographic accounts of historic tribes and knowledge held by modern indigenous communities. Some indigenous groups have been reluctant to share traditional medicinal knowledge with outsiders out of concern that it will be used by pharmaceutical companies wishing only to profit from the information without respect or acknowledgement to the indigenous communities and their intellectual rights. In North America, many species which we today consider to be weeds or nuisance plants had culinary or other importance to indigenous people. The plants most often used by Native Americans were also the most common and in many cases, are still common today. Plants were collected with respect and attention to conservation to ensure its survival. The time of year in which the plant was collected could determine its intended use. Some plants collected for culinary use as sprouts may be collected for their flowers or roots once mature, other plants become poisonous. It is important to know and understand the plants which are being collected. A depiction of Native Americans harvesting bark and fruit from trees near a settlement. The study of medicinal plants and substances through cultural knowledge is called ethnopharmacology. It is not secret that many over the counter and prescription drugs find their roots in nature. Aspirin’s pain relieving ingredient has its history in willow bark, which could be steeped in water and drunk as a tea. Beano, another common drug and anti-flatulent, gets its effectiveness from an enzyme found in the fungus responsible for black mold. Surprisingly, around 50% of cancer treatment drugs approved in the last 30 years are derived either directly or indirectly from nature. The most common ailments treated by medicinal plants were those of the gastro-intestinal system. Today, many natural teas can be found in your local grocery store intended to treat the same issues and using some of the same plants, such as mint and ginger. Although many native plants have fallen out of favor for culinary use, others have been elevated to such high status as to collect a hefty price tag at modern markets. In many parts of North America, spring brings an abundance of desirable wild foods including morel and chanterelle mushrooms, ramps (a wild leek with a mild garlicy onion flavor), and fiddleheads (fern sprouts). Foods (meat, maize, etc.) cooking in a pot over a fire. Pennsylvania is fortunate to host an abundance of wild plants. 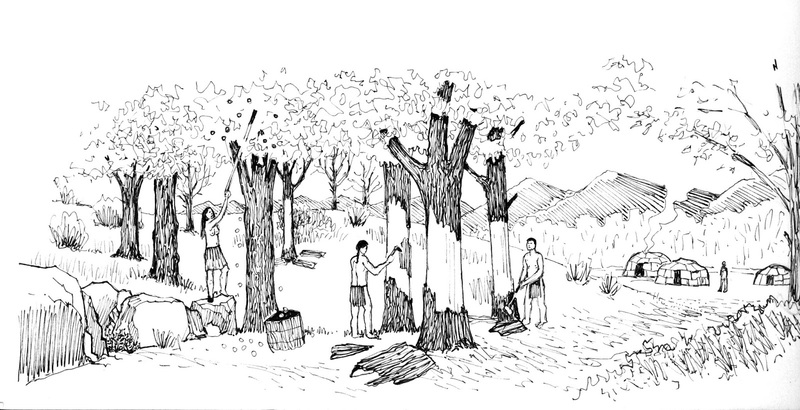 Modern foragers, much like those of the past, look forward to Spring when nature’s bounty abounds. With the shortest day of the year now behind us, we can look forward to Spring and all it brings. Densmore, F. (1974). How Indians Use Wild Plants for Food, Medicine & Crafts. General Publishing Company, Ltd.
Medve, R. and Medve, M. L. (1990). Edible Wild Plants of Pennsylvania and Neighboring States. The Pennsylvania State University. Here we are, the Workshops in Archaeology and Thanksgiving are over and the Pennsylvania State Farm Show and Christmas season have begun. As we prepare our exhibit for the Farm Show in January 2018, the lab archaeologists and ever valued volunteers, have been hard at work processing the artifacts found at Fort Hunter this past field season. 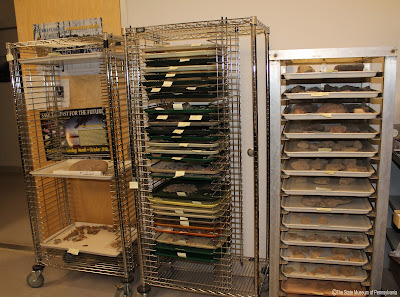 Today we are going to take a brief look at what happens to the artifacts once they come into the lab from the field and where we are in that process with this year’s artifacts. 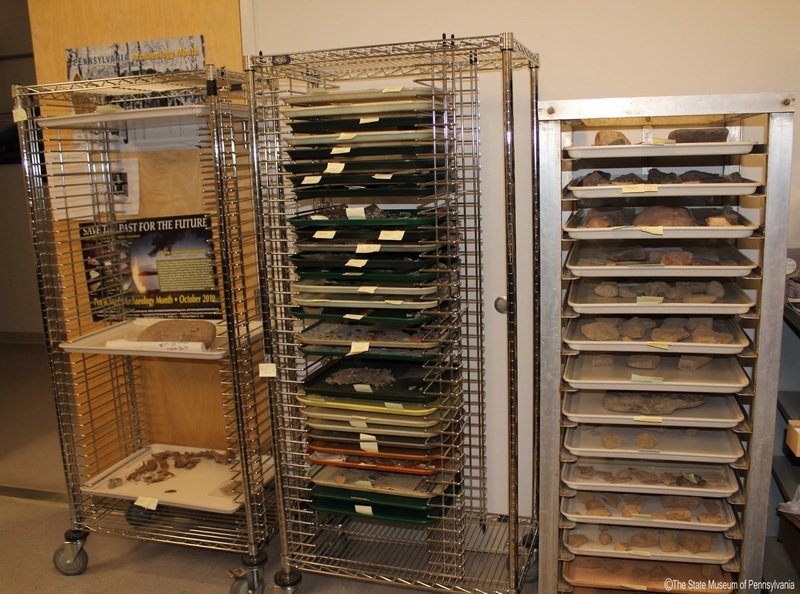 As mentioned previously in this blog, a general rule of thumb for the time it will take to fully process artifacts in the lab is approximately seven days of lab work for each day of field work, depending on the quantity and types of artifacts found. With the help of our volunteers this time is cut down a bit, but it is still a lot of work and a long process. The initial steps for processing any collection in the lab is to organize and record the provenience information from field bags through the preparation of a digital field bag inventory. The field bags are then organized by unit and level allowing for easy processing later on. Field bags organized by unit and level in bins ready to be laid out for washing. 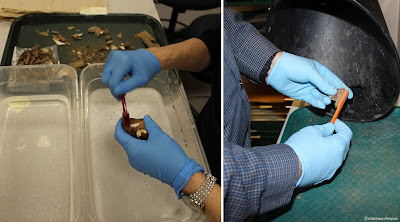 Once this is completed, the artifacts are laid out by bag on trays and the process of cleaning the artifacts through washing, dry brushing, or other conservation techniques begins. As can be seen above, we have already emptied a few bins of field bags and the image below shows some of the artifacts out and ready to be washed. As the artifacts are cleaned and air dried, the next step in the process begins, labeling. Artifacts are labeled with the site number, in the case of Fort Hunter the site number is 36Da159, and the catalog number, which identifies the location where the artifact was found. Catalog numbers are determined based on the provenience information recorded from the field bags. Once the artifacts are properly labeled, they are identified and bagged by type within each catalog number and then inventoried in a digital format, to make for easy lookup for research or exhibit creation. Currently in the archaeology lab, we have completed the initial organization and recordation of proveniences as well as the identification of catalog numbers for each provenience. Washing, labeling and identifying/bagging are currently occurring in the lab every day. This year we are taking our processing one step further by attempting to mend, or put back together, prehistoric pottery fragments to see if we can identify one or more vessels. This has proven difficult as there are many very tiny pieces of pottery and many of the larger pieces do not fit back together, but some progress has been made as can be seen in the pictures below. As we process the artifacts, it becomes more clear what types of artifacts are present in the collection and this year we seem to have an abundance of prehistoric artifacts such as stone waste flakes and tools, pottery and bone. This said, there are also numerous historic artifacts. Though very few of them date to the fort period they still help tell the story of the landscape. These artifacts include buttons, musket balls, butchered bone, nails of varying types and other architectural materials, historic ceramics and glass; as well as more modern artifacts such as plastic and Styrofoam. Rim and neck sherds of Owasco cordmarked pottery type, dating to c. 1200 to 1300 AD (Ritchie 1965). Additional rim, neck and body sherds from the Owasco tradition. Unknown pottery type, vessel body fragments mended back together. Incised rim sherd fragment of a Shenks Ferry Tradition vessel. Projectile points: top row: Madison type triangle point dates to the late Late Woodland Period (AD. 1450 - 1600. ), second row down Rossville-like point type, dates to the Middle Woodland Period (1,000 BP. – 2,100 BP.) third row down: Lehigh/ Koens-Crispin point type, dates to the early Transitional Period (4,350 BP. – 4,850 BP. ), bottom row right: the large broadspear/ knife, dates to the Transitional/Late Archaic Period (4,350 BP. – 6,850 BP.) bottom left: this point which could fall within Late Archaic through the Middle Woodland periods. Tin glazed earthenware (left) and scratch blue salt glazed stoneware (right). Both fall within the French and Indian War time period, though all were found in mixed contexts. Musket Balls of varying sizes and date ranges. Brass and pewter buttons dating around the late 18th and 19th centuries. As usual, the fort at Fort Hunter remains elusive, but each year we find little hints of its existence through artifacts. We continue to learn more and more about the landscape and how human occupation has impacted the land through the thousands of years of use that we have been able to identify through our excavations. We hope you have enjoyed this update on what is happening to the artifacts found at Fort Hunter during the 2017 field season and we wish you all a wonderful and safe holiday season! 2001 Classification Guide for Arrowheads and Spearpoints of Eastern Pennsylvania and the Central Middle Atlantic. Commonwealth of Pennsylvania, Pennsylvania Historical and Museum Commission, Harrisburg, Pennsylvania. 2015 Pennsylvania Archaeology: Time Periods. Electronic document, http://www.phmc.state.pa.us/portal/communities/archaeology/native-american/time-periods.html. 1971 A Typology and Nomenclature for New York Projectile Points. University of the State of New York, State Education Dept. Albany, New York. Originally published 1961, Bulletin No. 384, New York State Museum and Science Service.